May God bless this ship and all who sail in her, said Meryl Chertoff, wife of Secretary of Homeland Security Michael Chertoff, as she cracked a bottle of Champagne on the towering bow of U.S. Coast Guard Cutter Bertholf at the Northrop Grumman shipyard in Pascagoula, Mississippi in November. The newly-christened Bertholf, the first of the so-called National Security Cutters, is the product of two defense giants controversial coupling and the biggest piece yet of a sprawling service-wide modernization program. 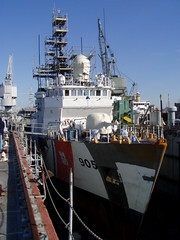 In 2001, Northrop Grumman and Lockheed Martin formed a joint venture, Integrated Coast Guard Systems, to win the then-$11-billion Deepwater contract to replace most of the Coast Guards ships, aircraft and command systems. Since then, Deepwaters cost has ballooned to $24 billion for 90 new ships and 200 aircraft. Perhaps worst, the programs much-needed modernized small cutters have proved to be a total wash. Fixating on these leaky, over-budget 123-foot boats, critics in Congress have assailed the joint venture. U.S. Representative Bob Filner (D-Calif) even characterized the firms allegedly shoddy work as criminal if not treasonous. But critics have ignored the successes of other Deepwater designs and perhaps miss the point of the partnership. Integrated Coast Guard Systems is the lead systems integrator on Deepwater, but it farms out work on many of the individual cutter and aircraft designs to other companies. Northrop Grumman is building the big cutters and four Global Hawk drones, but other firms are responsible for scores of smaller cutters, short-range boats and vertical-takeoff drones. EADS provided kits for helicopter upgrades and has delivered the first of 36 HC-144 patrol planes based on its C-235 transport. Lockheed Martin handles upgrades to the services HC-130 Hercules patrol planes as well as much of Deepwaters electronics, but General Dynamics contributes key parts of the latter. To Integrated Coast Guard Systems, platforms are secondary to integration, to the network that links the platforms together. And that network, more than any new ship or airplane, promises to eventually revolutionize the U.S. Coast Guard, assuming the services fleet hasnt rusted away to nothing in the meantime. But that's a big if. Read the rest of the story in the latest issue of Defense Technology International. Pics here.